Ever read the descriptors on a bag of coffee and wonder where they came from? Being able to distinguish different flavors in coffee takes practice, and this introduction to coffee tasting is a great place to start! We’ll start off by discussing how and why we taste, and why it is important to distinguish taste vs. flavor. We will gain confidence with using common coffee descriptors by reviewing the Coffee Tasters Flavor Wheel. 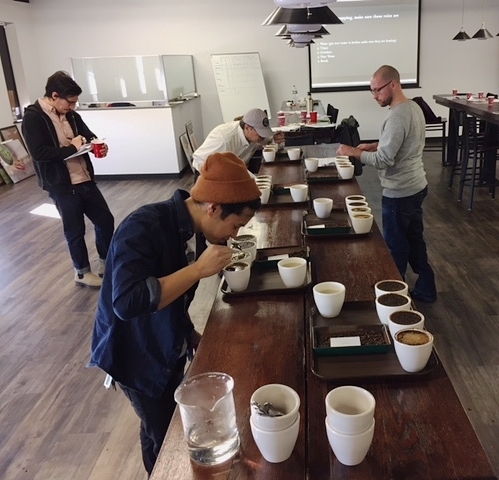 We’ll then put our new insights to the test by tasting 5 different coffees by “cupping,” the industry standard brewing method for evaluating and grading coffee, and consider how different flavors, acidities, and textures work together to create a balanced cup. In our time together, we’ll also learn more about coffee itself, including how attributes of a coffee are shaped by region and processing. There will be plenty of time for a Q&A after we’ve finished cupping.